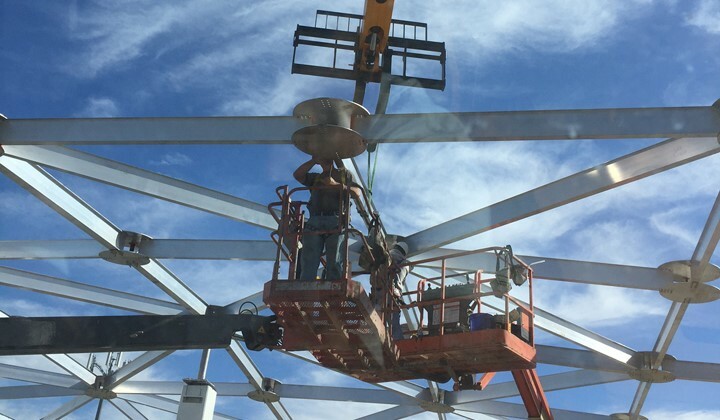 United Industries Group, Inc. offers a variety of alternative roof structures to give more flexibility to the use of your bolted, welded and glass-fused to steel tanks. They are also an excellent choice for roof repairs on existing steel tanks and concrete reservoirs as well as for odor control. UIG’s EVERDOME geodesic domes are spherical frame structures designed to be self-supporting. Primary horizontal thrust is contained by an integral tension ring. The geodesic frame is covered with attractive non-corrugated aluminum or stainless steel panels. These alloys have a proven history of weather resistance even in the harshest environments in the world. This virtually eliminates the need for periodic maintenance, coatings, or paint for the life of the structure. Each dome is designed with the most modern computer technology to check all loading combinations to ensure safety and integrity under all conditions. 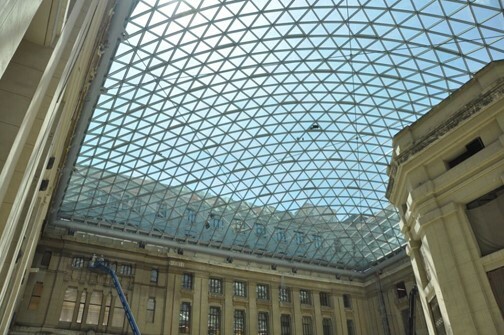 The dome covers are custom engineered for your individual structure. The self-supporting design allows maximum overhead space utilization and provides interference-free operation for floating roofs and other internals. The aspect ratio of the dome can be selected for your location and specific application, offering a range from a very flat, low profile to a high dome for more internal clearance. In addition, a wide range of accessories (vents, skylights, dormers, hatches, foam connections, etc.) are available to meet all your needs. UIG’s Geotruss Design and Clear Span Covers and Flat Panel Roofs are specifically designed and engineered for projects that are square, rectangular or angular in shape. They are ideal for covering concrete reservoirs, ponds or other in-ground storage tanks. 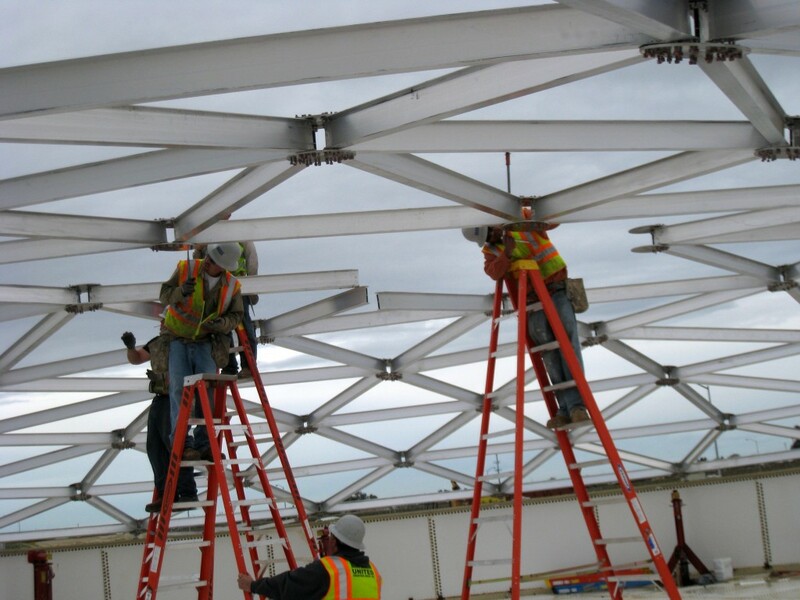 As with UIG’s EVERDOME Geodesic Domes, these covers are strong, lightweight and virtually maintenance free. Aluminum Self-Supporting Square or Rectangular Quadra-Domes up to 250FT in length x 250FT in width designed to AWWA D108-10std, ASCE 7-10, ADM2015, IBC 2012. An Internal Floating Roofs (IFR) will convert your existing floating roof tank. 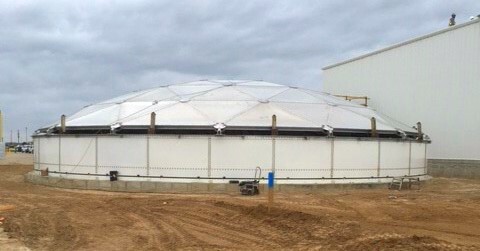 With only slight modifications to an existing tank, a lightweight aluminum dome may be set in place to convert an external floating roof system into a domed roof tank with an internal floating cover. This conversion will save operating, maintenance and replacement costs. Operation of your tank no longer requires attention to weather conditions. Snow, ice and water accumulations are eliminated, preventing product contamination, corrosion and the potentially expensive disaster of a sunken cover. The existing seal systems are free to work efficiently, as designed, without the hindrance of snow and ice build-up. 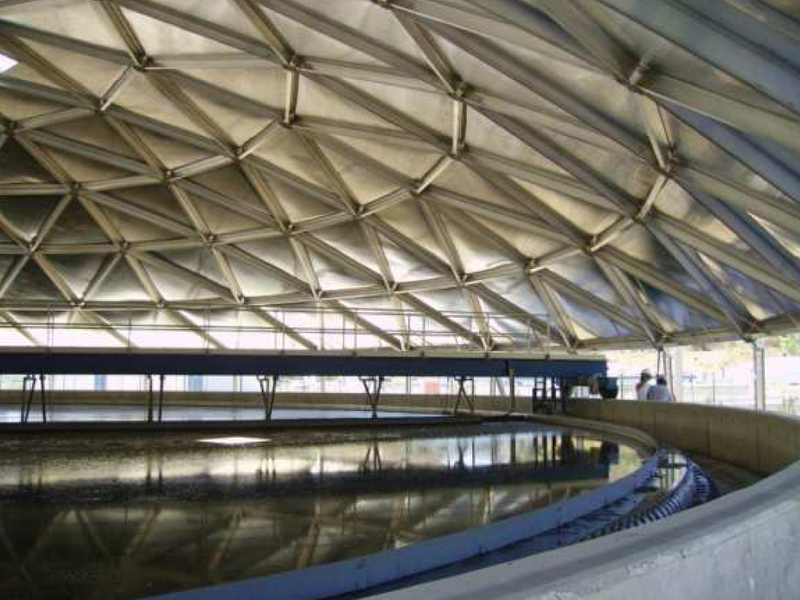 Labor and material resources previously reserved for maintaining your external floating roof tanks can be saved and used elsewhere in your operations. UIG’s covers are resistant to the elements, virtually eliminating the periodic expense of painting steel roofs. Additionally, maintenance costs of the external floater will be reduced substantially. By eliminating standing water, the friction of ice and snow loads, and high temperatures from direct sunlight, the coating used on the steel floater will last much longer. PSS Aluminum Dome Seal system life will be extended. Also, simpler rim seals may be considered at replacement time because the requirement to resist the elements is gone. The seals may now serve the simple purpose of product conservation. • The all aluminum Geodesic Domes and Internal Floating Roof construction provides a virtually maintenance free structure. 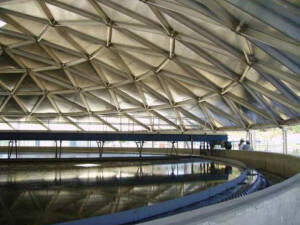 • UIG Large Diameter Tank Covers are designed to AWWA D108-10 standard and can be of any shape Circular, Oval, Rectangular, Square, Octagonal and can be self-supported or column supported (concrete or SS316). •Aluminum Self-Supported Dome Roofs area a great choice for replacing roofs on existing ground storage concrete tanks and reservoirs. •Keep precipitation and debris from entering the tank and contaminating the product. •The extremely strong yet lightweight design will add minimal weight to existing foundations that may not be designed for excessive loads. • Can be built on the ground and lifted into place or built directly on the existing floating roof and winched into place. 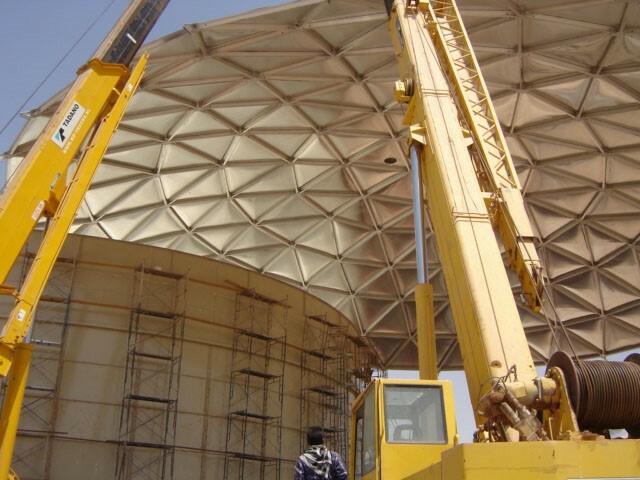 •Rapid field installation means minimum downtime at the job site. •Cutting edge technology controls odors in industrial environments such as Wastewater Management, Biogas Energy Recovery and Petroleum Plants. •Superior in preventing evaporation and increasing conservation of potable water. •PE stamp available in all 50-states.